Get free spins on House of Dragons in the best Microgaming Casino! In this video slot you will travel back in time to visit the ancient China. The online has perfect design. The symbols present Chinese lanterns, Feng Shui Coins, monks, archers, and Chinese fans beautiful Chinese melodies played in the background. House of Dragons is one of the earliest dragon-themed slots comes from development giant, Microgaming. The 5-reel, 20 payline video slot is styled with a three-dimensional effect. This gives players the perception of siting down at a physical slot machine. With the “retro” graphics you may have to squint your eyes to get that impression. However, with a number of features and a huge 200,000-coin maximum jackpot, House of Dragons is definitely worth a look. The slot machine also contains Fan Scatter symbol with amazing feature. When at least 3 of them appear anywhere on the reels player will get free spins. But wait, that’s not all – each Scatter opens and may contain a multiplier up to 10! The game also offers two Wild symbols. One of the wilds is usual and the other one doubles the winnings when creating a winning combination. The wild symbols also substitute for all game symbols except for Scatters and Bonus symbols. In addition to the slots standard Wilds and Scatters, the appearance of three or more Bonus symbols will trigger the slot’s second-screen Archery Game bonus. During the bonus game, players gamble their bonus amount by shooting targets that could multiple it by as much as 4 times. With each successful gamble, players get the opportunity to either collect their winnings, or to continue to gamble the amount for a chance to unlock a larger win. 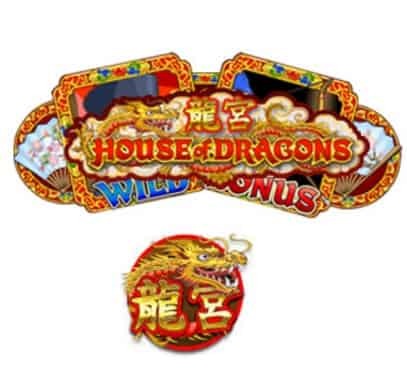 House of Dragons slot is available to play in free play mode in both, desktop and mobile devices.